Looking to make the most of your narrow lot? The light, bright and spacious Sapphire is sure to appeal. Designed to fit blocks 13 metres wide, this three-bedroom, two-bathroom home employs clever design to create a very liveable family home. The Sapphire display home Dayton, is cleverly zoned to maximise living space, with the master suite located to the rear of the home. Homeowners will appreciate the resort-style qualities of this space, in particular the luxury ensuite with free-standing bath. There’s no shortage of living space in the Sapphire, with a home theatre and study offered in addition to the open-plan living and meals area. Don’t need a study? This room could just as easily function as a fourth bedroom, or nursery. The Sapphire is sure to be a hit with both first homebuyers and downsizers, who will appreciate the home’s low-maintenance qualities, abundance of living space, and high-spec chef’s kitchen, complete with walk-in pantry and separate scullery! Sized to fit a 13m block frontage, the Sapphire is an innovative 3×2 home design. 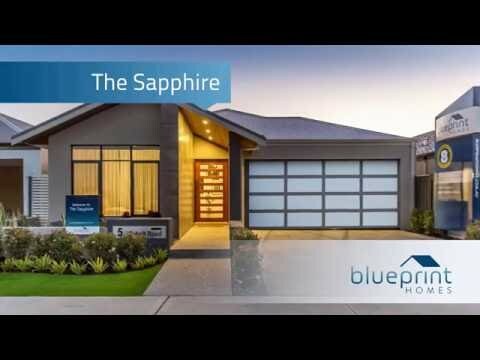 To find out more about The Sapphire visit the display home in Dayton or contact us now. Financial Services are provided by InReach Finance. InReach Finance is a subsidiary of Blueprint Homes and is an Authorised Credit Representative 470699 of DMEE Holdings Pty Ltd Australian Credit Licence 469248. *$248 per week is based on a 95% home loan with interest only repayments for a $326,436 house and land package in Ravenswood Green with a home loan at 4.19% pa over 30 years. All applicants must meet the lending criteria of the financial institution. **Strictly for a limited time only. Terms and conditions apply & Fees and charges apply. Home Loan is based on the Westpac Flexi Options Home Loan which is 4.19%. Comparison Rate 4.72%. Home loans includes Loan Mortgage Insurance of approximately $8,276 and relies on a client contribution of $18,178. First Home Buyers Grant may be used as part of the contribution, please seek clarification by contacting an InReach Finance Representative. This offer is only valid whilst the Westpac promotion is active. All Finance Services are provided by InReach Finance, Credit Representative 470699 of Australian Credit License 469248. InReach Finance is a subsidiary entity of Blueprint Homes. $315 per week is based on a $364,897 house and land package in Ravenswood Green. 97% interest only loan at 4.63%pa over 30 years. All applicants must meet lending criteria of the financial institution. Terms and conditions apply. Fees and charges apply.